After all the furore about the programme switching channels, the latest series of The Great British Bake-Off has come to an end. We may have missed Mel and Sue’s naughty innuendos and Mary Berry’s ‘sheer perfection’, but the public enjoyed the new version anyway. We’ve all imagined what we’d make if we were on the Bake-Off, even if we never apply to go on the show. Whether you want to make a lavender and balsamic vinegar cheesecake, or chilli and turmeric shortbread, the contestants all need the same three ingredients to succeed. The same is true if you want a show-stopping email marketing plan. You need solid, reliable, managed high-quality data. It’s much like the old computing adage — put garbage in, you’ll get garbage out. That’s why emailing to purchased cold email lists gets low response rates. If those people didn’t opt in to receive your emails why would they be interested in hearing from you? You’re better off creating a high-quality lead magnet to convert visitors to your site into future paying customers. Email marketing shouldn’t be separate from your overall marketing strategy. Understanding that strategy makes writing your emails much easier. Where does the email you need to send fit into your marketing mix? What message do you want to send and at what time in the customer journey do you need to send it? Answer these questions before you create a show-stopping email marketing plan. Taking a cake out of the oven too soon can cause it to sink. Leaving it in too long leads to dry, burnt, or crispy cake (not a good look). The same applies to email marketing. It’s all about timing. Getting the right message to the right person at the right time gets the right result. Send too early and a customer can feel harassed. Send too late and they might have started shopping elsewhere. Create your show-stopping email marketing plan. Say you send a normal email campaign to your list. Your average results might be a 15–25% open rate. That’s like making a cake with the ingredients you have in the house because a friend drops round without warning. The cake might taste alright but it’s not as good as it could have been if you’d planned it. It tastes ‘last minute’, disappointing your friend. Random emails to your entire list can feel the same way. These emails are about you, not your customer. And it shows. Let’s say you buy better ingredients next time. Your cake improves. In email marketing terms, that’s the point where you segment your audience. Your results double, moving you to the 25–50% open rate range. Why does segmentation matter? Not all of your customers are the same. They don’t want or need the same things from you at the same time. Let’s look at an example. You want to reward loyal customers with a surprise discount. Using your data, you filter out the consistent customers and only send the discount to them. Because they’re loyal customers, they’re more likely to open the email in the first place. A brand new subscriber who hasn’t bought from you yet might not open it. Even if they do, do you want to give an unknown entity a discount so soon in the relationship? They might come to expect more freebies and discounts. Or the discount might devalue your product if you send it too early. Now I know what you’re wondering. How do you make the show-stopping email marketing plan? You automate the process. Sending the right message to the right contact at the right time moves your email marketing to the 50%+ open rate. Automation is key to removing the complexity of your email campaign. Most people shy away from email automation because they’re confused by the set-up process. Or maybe they’re worried the emails might appear ‘cold’ or ‘distant’ because you wrote them so far before being sent. It’s not surprising. ‘Automation’ isn’t a warm, cuddly, human word. But it’s efficient — which is what counts. If you don’t use email automation yet, you’re not alone. 42% of companies admit to not sending targeted messages. Their emails, no matter how witty, amazing, or beautifully written, risk being unopened or deleted. Let’s go back to the baking metaphor for a moment. You bake an amazing coffee and walnut cake, using the best ingredients and a proven recipe. But then you pop round to your friend’s house to surprise her with it. What if she’s out? Or she’s just received bad news? Perhaps she’s in, but she has a visitor who’s allergic to walnuts. You might have an amazing product but if the timing is wrong, it’s worthless. With automation, that can’t happen. You set up triggers so that the right emails get sent at the right time. Put another way, that’s like setting a calendar alert on your phone for your friend’s birthday. You get the alert, bake the cake, and become her BFF when you take it over. Automation means your subscribers get emails based on their behaviour. If they don’t take certain actions, they don’t get certain emails. Rather than blasting them with all the content you send, you only send what’s relevant to them. Work out the triggers and your automation designs itself. Identify the points that will trigger automated emails. Do you know your product normally lasts around 40 days? Send them a reminder to buy a refill after 30 days. Do you send ‘abandoned cart’ emails to customers who start to shop but don’t buy? There’s another trigger point. Maybe it’s a period of time in which they haven’t bought anything. Work out what will happen to trigger an email from you. Then write the email and set up the automation. That’s how to create a show-stopping email marketing plan that keeps you winning. That’s a Hollywood Handshake right there. Finding the right marketing automation partner. To continue with the cake making example, you can put a huge amount of effort into mixing your ingredients or you can make life easier for yourself by using the right equipment. 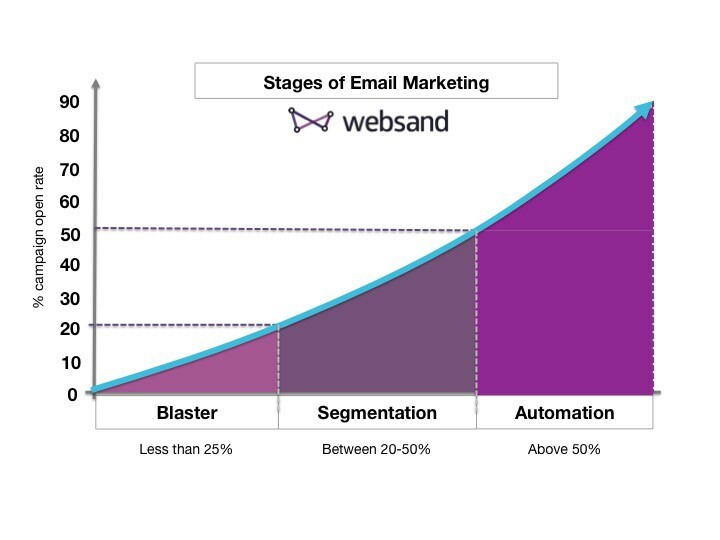 Websand was built to help marketers create show stopping email marketing programmes. The platform helps you dynamically manage your data and create automation programmes that are driven by your audience. Saving you huge amounts of time and dramatically improving your marketing results. We can work with you or you can do it yourself. The decision is yours. Click the box below or schedule a demo.